“So many flower essences, which one should I use?” Sound familiar? With this book you can easily look up different states of being and find the flower essences that support or harmonize them. 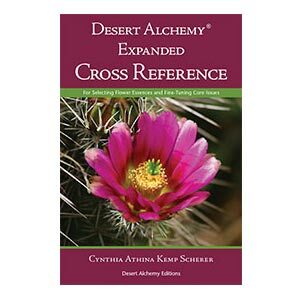 This book is based on thirty years of experience with desert flower essences. Cynthia Athina Kemp Scherer has been a pioneer in flower essences since 1983. She is the founder of Desert Alchemy, in Tucson, Arizona, USA. She is the co-creator of desert flower essences from the Arizona deserts, an international seminar presenter, and the author of The Alchemy of the Desert, The Art & Technique of Using Flower Essences, and Desert-Alchemy.com.